This marks a new low or Hamas, who is so used to using women and children as human shields to use innocent animals as target practice and cover for their evil deeds. Disgusting! It couldn't have happened to a more deserving bunch of people. It's the horses I feel sorry for. Scary stuff, horses vs. nukes. How stupid and evil can the palestinians get and when are they ever going to learn that violence will not get them anywhere. 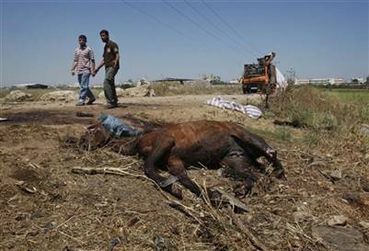 This is horrible, it's bad enough to sacrifice people, now they are killing horses. I will take the horses any day Locan! It's obvious these people have no respect for animals,I am disgusted by their cowardly actions.